For those of you who were not at Paul Bennett’s inaugural professorial lecture last Tuesday, I thought I would let you know that Professor Louise Wilkinson is joining Jackie Eales as head of the newly relaunched Centre for Kent History and Heritage. I believe the Centre will now come under the Faculty for Arts and Humanities directly, rather than being under the School of Humanities, which may allow it to develop wider links and shared goals across the university. As the head of the Faculty, it was good to see Dr Keith McLay in the audience on Tuesday. 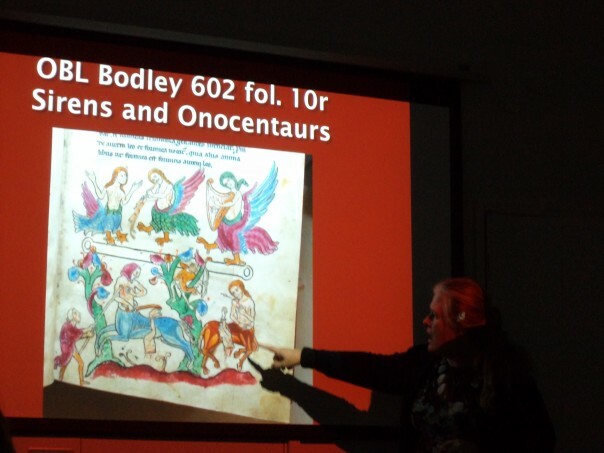 Indeed, there was a large audience in the Michael Berry lecture theatre, in part because there was a sizeable contingent of staff from Canterbury Archaeological Trust, several of Paul’s family, a large number of people from across east Kent, and some from the west of the county. This expectant throng had enjoyed the hospitality provided by the Centre and were fascinated to hear about Paul’s upbringing in the east Kent coalfields, his father having been in charge of the mining locomotive steam engines, including ‘St Thomas’ and ‘St Dunstan’. Paul is very much of mining stock, and even though he didn’t follow his father, both his maternal and paternal grandfathers had worked in the mining industries of Staffordshire and Yorkshire before their respective families came south. Even though the mines have now gone, the mining communities of Shepherdswell, Snowdown, Aylesham and Betteshanger remain and part of the glue that holds them together and in some ways separates from much of the county is this shared mining past. This is important because mining has become part of Kent’s heritage, and just as in former times it is the arrival of a skilled workforce with its distinctive culture that has enriched the community in which it finds itself. Perhaps the best known of these migrants are the Huguenots and Walloons of the 16th and 17th centuries who brought cloth-making skills relating to the manufacture of the ‘New Draperies’ and silks at a later date. However, having spent part of this week looking at the foreigners or ‘aliens’ who came to live and work independently in Canterbury in the 15th century, it is clear that others, especially Flemings were present, as they were in the Weald during the earlier period. Among such men were the tailor John van Cornbeke who was living and running his business in Burgate ward in 1412 and the subsequent year. Apparently less successful was another alien tailor, referred to as a ‘Ducheman’, also living in Canterbury in 1413 and a Fleming called Richard Gilbert, who was licenced for a single year in 1417. This digression is very much in keeping with one of the themes of Paul’s lecture that history matters, whether it was produced by the indigenous population or later arrivals, the conquered or the conquerors, the rulers or the ruled. Furthermore, yes, the remains from antiquity are precious, but equally so are those from the recent industrial past, hence it is as important to treasure the mining heritage of Snowdown as it is to value the Hellenic past of Libya. At times, this has to be at governmental level, a combination of large-scale funding and legislation. Yet also important is the role of the local and regional community – of people who care, who see the value of their heritage and culture and that it is critical for the present and for the future well-being of the community, the commen wele as it was known in the Middle Ages. 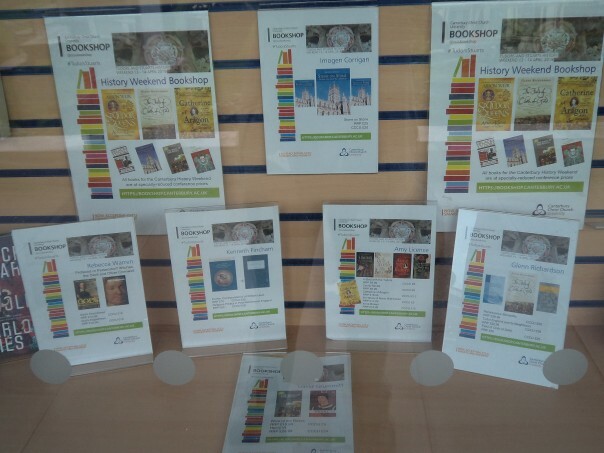 Such ideas have been behind several initiatives in this part of Kent, including the Folkestone People’s History Centre at Folkestone, which has strong links to Canterbury Christ Church through Dr Lesley Hardy; the work of Dr John Bulaitis and the local history society at Nonington, and Louise Wilkinson’s involvement in the Magna Carta project that brought her into contact with local organisations at Canterbury, Faversham and Sandwich. To return to Paul’s lecture, he highlighted just how fortunate he was during his teenage years and twenties to meet a host of inspirational people. Many of these were giants in the field of archaeology in the 1960s and ‘70s and Paul had worked on a wide range of archaeological excavations, both in Kent and Libya at a time when the opportunities were especially plentiful. 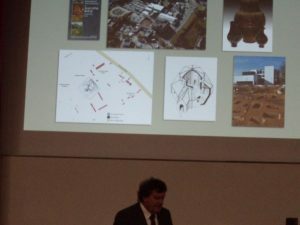 Through his impressive array of slides, Paul gave his audience a taste of the riches he had been privileged to experience at a host of classical Greek, Roman, Byzantine and Arab urban sites. For example, he described how he was involved in the finding of inscribed Greek tablets that described an attack by Corsican pirates, the tablets later used to pave the nave of a Byzantine church that was sacked in 643 AD. 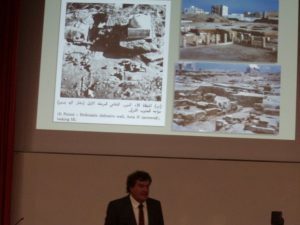 Although nothing in Canterbury or Kent can compare to these fantastic classical sites in Libya, Paul offered his audience some insights into Canterbury’s Iron Age and Roman past. Several of the city’s most important buildings were the subject of early excavations by Canterbury Archaeological Trust and Paul worked with Tim Tatton-Brown, the Trust’s first Director, on several of these. The Marlowe, Stour Street, and Castle Street excavations brought evidence of the Roman public baths, temple precincts, and the two theatres; and perhaps just as important in some ways, evidence of a set of wheel ruts from the Anglo-Saxon period in the orchestra section of the second theatre. Other sites outside the city walls have yielded important information about Roman burial practices, and further excavations between Augustine House and the slip road to Canterbury East station in early 2017 may fill in even more pieces of the history of late/post Roman Canterbury. Moreover, as Paul demonstrated, Canterbury is highly fortunate in terms of the survival of a section of Roman city wall fossilised in the nave wall of St Mary Northgate church that sat above the gate of the same name. Overall, Paul provided his audience with a fascinating tour of ancient Libya and Canterbury, as well as offering some insights regarding how he came to dedicate his life to archaeology, a love affair that shows no signs of waning. Indeed, Paul will be using the information gleaned from a number of archaeological excavations in the grounds of Canterbury Christ Church at the Tudors and Stuarts Weekend. As his second guided walk on Saturday 1 April, he will be exploring ‘a minor royal palace’ that was on both the university site and that of the King’s School. 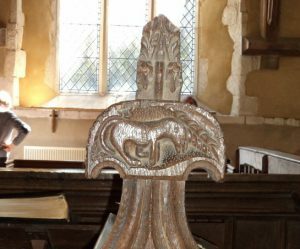 There are still a few places left so if this sounds interesting, do check out the Weekend’s website at http://www.canterbury.ac.uk/tudors-stuarts where you will also find many other interesting events.